On November 17, 2002, 43rd animated feature film Treasure Planet had its world premiere at the Cinerama Dome Theater in Hollywood, California. Those involved with the film attended the premiere, including directors/writers Ron Clements and John Musker, songwriter John Rzeznik, animators Glen Keane and John Ripa, and actors Joseph Gordon-Levitt and David Hyde Pierce. Other celebrities that attended the premiere included Melissa Joan Hart, Daveigh Chase, and John Ripa. The film would go on to be generally released November 27, and was released in regular and IMAX formats simultaneously. Posted in Uncategorized and tagged 2000s, Actor, Animated Feature Film, Animator, Director, Film Premiere. Bookmark the permalink. On October 16, 2003, eleven members of Disney history were inducted as Disney Legends. Among those honored were comic publisher Al Taliaferro; Disney representative to New Zealand, Neil Beckett; actor Buddy Hackett; director Richard Fleischer; wife of Disney and supporter of the Disney Company, Edna Disney; advisor and trustee of the California Institute of the Arts, Harrison “Buzz” Price; former Vice President of Engineering, Design, and Production, Orlando Ferrante; composer and co-founder of Disneyland Records, Tutti Camarata; comic strip artist Floyd Gottfredson; voice actress for Cinderella, Ilene Woods; and last but not least, Lillian Disney, who performed many behind-the-scenes acts to keep the company, and her husband’s legacy, alive. Among the eleven honored, only five were alive at the time of the ceremony: Richard Fleischer, Harrison Price, Orlando Ferrante, Tutti Camarata, and Ilene Woods. Posted in Uncategorized and tagged 2000s, Comic, Director, Disney Legend, Imagineer, International, Music, Voice Actor, Walt Disney Records. Bookmark the permalink. On April 21, 1915, Lloyd Richardson was born in Portland, Oregon. He attended the Los Angeles City College but, during the throes of the Depression, he dropped out to start working. He was able to score a job in traffic at the Disney Studios in 1937, and soon after joined the Editing Department, where he was able to flourish. 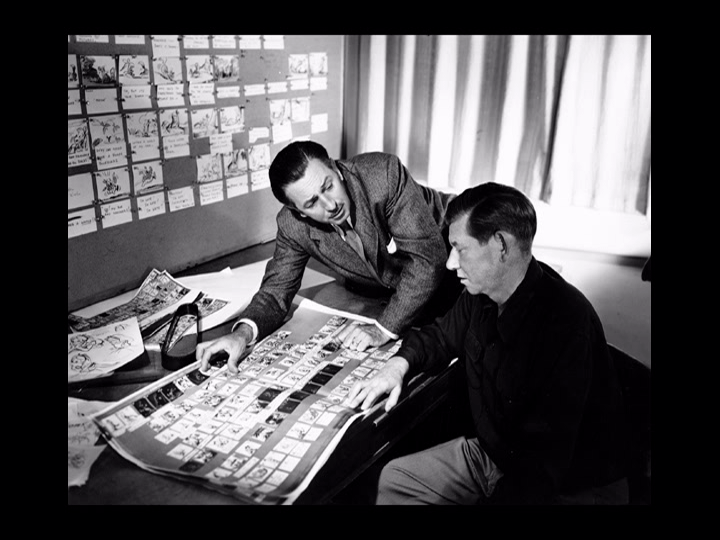 Starting with Snow White and the Seven Dwarfs and Pinocchio, Richardson quickly learned the craft of film editing, and soon became an editor-at-large for a variety of projects, including foreign film editing that helped match foreign language tracks to the animation, and editing the training films by the studio during World War II. He continued to edit the animated features as he moved his skills to the True-Life Adventures series, eventually editing the Academy Award winning shorts Bear Country and The Vanishing Prairie. As the studio progressed into the television medium, Richardson moved into directing alongside editing, and eventually worked on over 50 different television projects. For his body of work, Richardson has won an American Cinema Editors Award for Chico, The Misunderstood Coyote, and an Academy Award with Ward Kimball for the short film It’s Tough to Be a Bird. He retired in 1980, after 40 years with the studio. He was honored as a Disney Legend in 1998. He passed away in 2002 at the age of 86. Posted in Uncategorized and tagged Animated Feature Film, Births, Dedication, Director, Disney Legend, Live Action, Television. Bookmark the permalink. On March 25, 1996, the 68th Academy Awards were held in the Dorothy Chandler Pavilion in Los Angeles, California. At this ceremony, John Lasseter was awarded a special Academy Award for the creation of the first fully computer-animated feature film, Toy Story, calling its creation a milestone in the achievement of motion pictures. The film had been a long time in the making, going back to Lasseter’s aspirations after starting at Disney decades earlier. Lasseter showed up on stage to receive the award, bringing with him a Woody and a Buzz Lightyear toy. Lasseter thanked the Academy for its longtime support of student filmmakers, as well as everyone at Pixar and Disney for their support and effort into making the film. Posted in Uncategorized and tagged 1990s, Academy Award winning, Computer Animation, Director, Technique. Bookmark the permalink. On December 19, 1914, Melvin Schwartzman (who would change his last name to Shaw) was born in Brooklyn, New York, to an opera singer mother and a lawyer father. He displayed great artistic talent at an early age, being selected for the Student Art League Society and winning a Procter & Gamble soap carving contest. In 1928, his family moved to Los Angeles, though he left at one point to try his hand at being a cowboy, despite winning a scholarship to an art institute. He soon returned to California, where he found a job at Pacific Titles creating title cards for silent films. Shaw’s first animation job came with the newly formed Harman-Ising Studios, where he took on several roles including animator, character designer, story man, and director. Shaw played polo in his spare time, where he met Walt Disney, who would invite him to join his studio. Shaw left Harman-Ising and joined Disney in 1937, where his first main project was the 1942 film Bambi. He left Disney during World War II, choosing to serve in the U.S. Army Signal Corps, working as a filmmaker and cartoonist. After the war, while not going back to Disney, he did work with the company through his new company, Allen-Shaw Productions (a partnership with former MGM Studios animator Bob Allen). He was asked back to Disney in 1974 to help transition animation from the old guard to the new, bringing his expertise to such films as The Great Mouse Detective and The Lion King. For his multitude of work for Disney, Shaw was honored as a Disney Legend in 2004. In 2012, at the age of 97, Shaw passed away. Posted in Uncategorized and tagged Animator, Births, Director, Disney Legend, Story. Bookmark the permalink. On January 24, 1906, Wilfred Jackson was born in Chicago, Illinois. After attending the Otis Art Institute in Los Angeles, he went to the Walt Disney Studios to ask for a job; although not officially hired by the Studio, he washed cels and assisted the animators. Jackson rose quickly through the studio ranks, and shortly after he arrived in the animation department, he created the method of synchronizing sound to the animation for the Mickey Mouse short film Steamboat Willie. It would take rival studios over a year to figure out how the trick was done. Jackson would go on to direct 35 short films, with three winning Academy Awards; he would also help direct segments of animated feature films, including the “Night on Bald Mountain” segment in Fantasia. As Disney entered television, Jackson moved into the new medium, directing 13 episodes of the Walt Disney anthology series. In 1965, Jackson retired from the Disney Studios. He passed away on August 7, 1988. In 1998, Jackson was honored as a Disney Legend in the field of animation. Posted in Uncategorized and tagged Animator, Births, Director, Disney Legend, Technique. Bookmark the permalink.